Sleaford 243, Boston CC 1sts 246-4 - Boston won by six wickets. Jon Cheer. Photo: David Dales. Tom Baxter praised his side’s character after a late flourish secured a dramatic victory over Sleaford at the Mayflower. “It was a great result and one where we had to show a lot of character,” the skipper said. 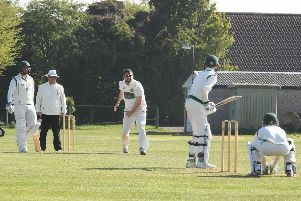 Boston’s 20-point haul saw them leapfrog Sleaford and Alford to end the weekend in sixth place in the Lincs ECB Premier. Ricky Lovelace in bat. Photo: David Dales. The coin came down in favour of Sleaford’s captain and, after a little bit of hesitation, he did eventually decide to bat. Scott Elleray and Paul Deans opened the bowling for Boston and it wasn’t long until Deans had Jack Wilson caught for zero by Baxter at mid-wicket. The start was made even better when Andy Hibberd mis-timed his drive to the skipper again, this time off the bowling of Elleray. The ideal start was nearly there but Tom Shorthouse and Cephas Zhuwao were both dropped before reaching double figures. Shorthouse and Zhuwao then set about taking the game to Boston’s bowlers with some interesting strokeplay. Shorthouse went for 35 when Fayadh Haffejee took the catch off the bowling of Baxter. Another very good partnership between Zhuwao and Matthew Mountain put Sleaford in the box seat. With 16 overs to go, Sleaford were well set on 193-3 and looking at posting a minimum of 300. Instantly after drinks, Deans removed Zhuwao for a fantastic 126 from 106 balls. This wouldn’t have been possible if it wasn’t for Dan Sincuba’s amazing catch while running backwards. “It was another great catch from Dan,” Baxter said. Mountain then fell to another Sincuba catch, this time a one-handed diving catch off the bowling of Elleray to give him his second wicket. The score went from 193-3 to 203-7 when Cameron Hall found the safe hands of Jon Cheer off the bowling of Deans. Two more Elleray wickets and a wicket a piece for Baxter and Haffejee saw Sleaford bowled out for 243 from 49 overs. Elleray ended with 4-60 from his 14 overs and Deans picked up his three wickets and only conceded 48 runs from his 14 overs. At the tea interval, Sleaford would have been happy with the score they had on the board, but Boston would have been happy they weren’t chasing a total of around 300. Kieran Evans and Ricky Lovelace fought hard early on as the bowlers had the upper hand. Lovelace was caught for 19 and Boston were 44-1. A 65-run partnership followed from Cheer and Evans before Evans was given out lbw off the bowling of off-spinner Shorthouse. At 109-2, Boston knew that an increase to the scoring rate was needed if they were to get anywhere near the total. Sincuba fell for four and that brought Haffejee to the crease, joining Cheer. Cheer was next to go for 66, and at that stage, Boston needed 90 runs to win from 13 overs. At seven runs per over and a new batsman entering the innings, Sleaford would have still backed themselves to win the game. However, what was to happen next was something extraordinary. The partnership of Michael Musson and Haffejee saw the boundaries come at regular intervals and, with two overs spare, Boston found themselves passing Sleaford’s impressive total. Haffejee’s 46 came off 34 balls and Musson’s 47 came off 31 balls. Due to his impressive innings that saw Boston over the line, the matchball sponsor, Thompson Richardson Ltd voted Musson as man of the match.